Quick question, compatible with pre-doom submods? I took a glance and didn't notice anything that clashed with it really. So yeah I'd say it's compatible. Anyways this is not ready to get uploaded yet but here is an image example.. 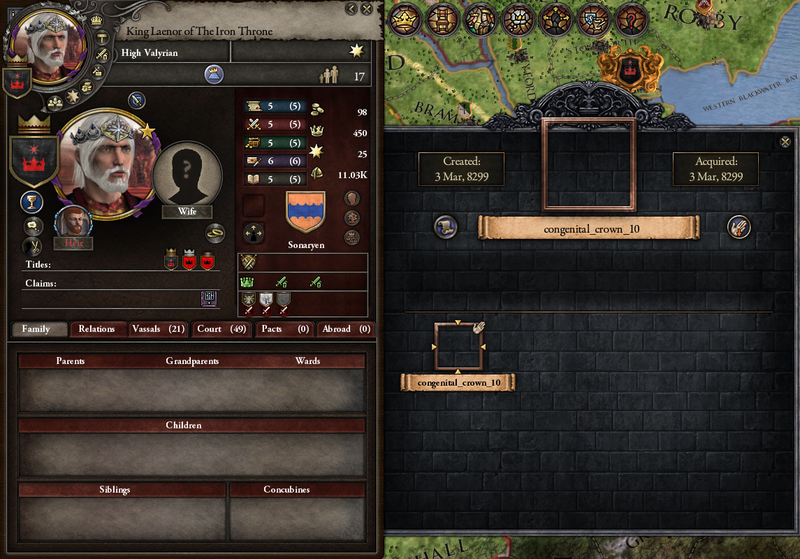 In vanilla AGOT, there are about 20 unique special crown artifacts that can be obtained. If you equip one of these artifacts it changes your portrait to use that crown (thanks to property 17). So the graphics from Mayonez had 12 brand new Crowns... 3 House Baratheon, 1 Reyne, 1 Tully, 1 Lannister, 1 Arryn, 1 Tyrell, 1 Dayne, 1 Tarth, 1 Frey, 1 Hightower crowns. I have created 12 new artifact crowns (Images from crowns are not ready yet), which if you equip one of said crowns it will work like how the 20 from vanilla work. I thought this was the best way to bring the new crowns into the new landscape of the game. I haven't set this up yet, but will probably try to make it so that if you're playing as say one of those dynasties(OR THEIR DEFINITE SPECIFIC CADET BRANCHES) and become a king (capable of using a crown) you will automatically gain that specific crown.. If it's possible. If not then am not sure. Thanks for updating Lancelot!! but what happened to Roose Bolton and Jon Snow? I Think their DNA is the same as vanilla but Rooses hair looks barbarian and he got that barbarian looking beard and Snow's head is shaven. Hair graphics for notherners was changed... So he's still got the same exact dna/properties, only now slot 14 (example) is barbarian hair/beard instead of slot 14 (example) old of balding and clean shaven. OK, I understand! But what happened to 26 hairstyles per culture? I counted 16 as Petyr Baelish, will you add the ones the dev team added in the latest patch aswell? Customizer DLC has issues with showing all hairs. I could really use some artifacts based off of the LAST 12 crowns from that file. Lancelot, just a question, but in previous versions (unless this is mistaken nostalgia speaking), you had custom histories for many major characters, changing their traits and "updating" them in light of your congenital mod. Now, when I look at 1.6's character folder there are barely any of the major characters in the books, just ancestors and stuff. Why? P.S. Oh yeah, I have been using Novus Graphicus thanks to you mentioning it in one of your comments, and I have one query: what's with the weird darker "patches" in ares? Other than that, it looks great. Oh by patches I mean on the map itself Lancelot. Like the world map has darker blue areas than others...Is it because of Novus Graphicus? No no no you misunderstood what I was saying lol. "Lancelot, just a question, but in previous versions (unless this is mistaken nostalgia speaking), you had custom histories for many major characters, changing their traits and "updating" them in light of your congenital mod. Now, when I look at 1.6's character folder there are barely any of the major characters in the books, just ancestors and stuff. Why?" The reason I used to include several history files was because CO used to add eyepatches to be obtainable by characters (left and right eye patches) that would save through the history files. However I think it was Reapers Due or whatever when that came out, they added a hugely expanded eye patch system as well as a trait based method. Now because there is a better method for eye patches, the only reason I include edited history files is to fix a small(lol) amount of dwarves. IE: Making Tyrion Lannister dwarf_2. I didn't answer the Novus Graphicus bit but the patches are because of video settings I think. If you're talking about the oceans, look closely and you'll notice that it's actually bc the continental shelves are drawn to signify depth. Pretty lovely IMO. Other than that I've never had any other "patches" on Novus Graphicus for either vanilla or AGOT.